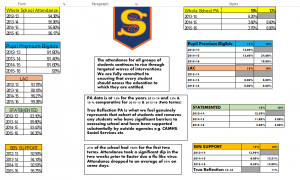 We were impressed by your data examples and that you have SEN performance management targets. We are glad to see that the windscreen model developed as part of Every Child Matters has been embedded into your practice. The Stanway School is a large mainstream secondary school based in Colchester, Essex. We have 1161 students on roll and a national average intake based on KS2 prior attainment. The number of students with a statement or EHC Plan is broadly in line with national average (1.5% of school population) and the number of students with SEN Support is slightly below national average at 8.8%. Approximately 40% of our student on the SEN register have a diagnosis of Autism. We have a lower than national average number of students who are eligible for free school meals (FSM) at 16.2% of the school population. We have slightly less girls than boys on roll at 46.3%. In 2014, SEND results for the school were below national average. Students with a statement made significantly less progress than the national average with a Value Added score of 925.7. It was during 2014 when, as a school, we embraced the New SEN Code of Practice as an opportunity to develop our inclusive practice and whole school offer for SEN Students. A clear focus on high quality teaching for all students with a specific focus on removing barriers to learning. This also involved the development of student centred passports following a meta-cognitive approach to remove barriers to learning and inform teachers on how to personalise learning for SEN students. All SEN students and parents have a termly review with their allocated Keyworker, focused on identifying barriers to learning and following a solution focused approach to remove these barriers and personalise the support as necessary. Student and parental voice and decision making is integral to this process. SEN focused CPD for all teaching staff. For example, we have provided teaching staff with Autism training (8 hours over 6 twilight sessions) following the ‘Maze approach’ including the use of social stories to develop our inclusive offer for students with Autism. As a result, we now have ‘SEN Champions’ within each department to advise on SEN strategies when difficulties arise. Creation of safe spaces and sensory equipment available in Head of House office (Pastoral). Sensory breaks implemented for selected students with Autism and Sensory difficulties. Educational Psychologist, Speech and Language and Specialist Teacher CPD delivered to all teaching staff covering various SEN areas. Personalised curriculum: Additional English classes and Maths 1:1 for year 7 pupils with low literacy and numeracy skills. Three year KS4 with a newly developed Pathway including the ASDAN course. Extraction and 1:1 sessions responding to need throughout KS3 and KS4. Effective provision mapping ensuring funding and SEN resources are deployed effectively to aid inclusion. 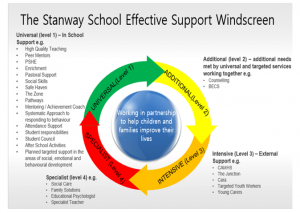 Effective Intervention analysis to ensure developmental areas are addressed effectively. Interventions follow the graduated approach at Wave 1,2 and 3. Teacher are accountable to ensure effective interventions within the classroom. This is followed up through line management meetings with Heads of Department. SEN Performance management targets (PMR) are set for teachers to ensure inclusive classroom practice is at the centre of teaching. Development of the use of LSAs following the MITA approach. 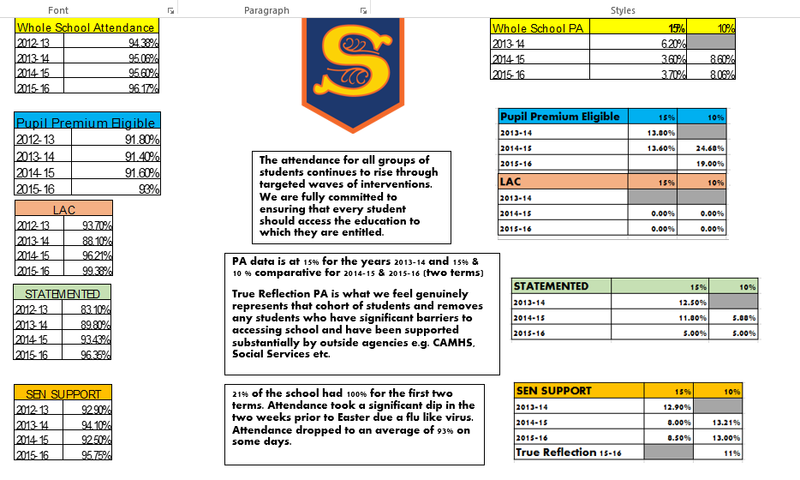 Improved LSA pedagogy to support progress and inclusion of SEN pupils. LSA PMR Targets linked to Interventions, Subject classes and / or Specific Students. 1. 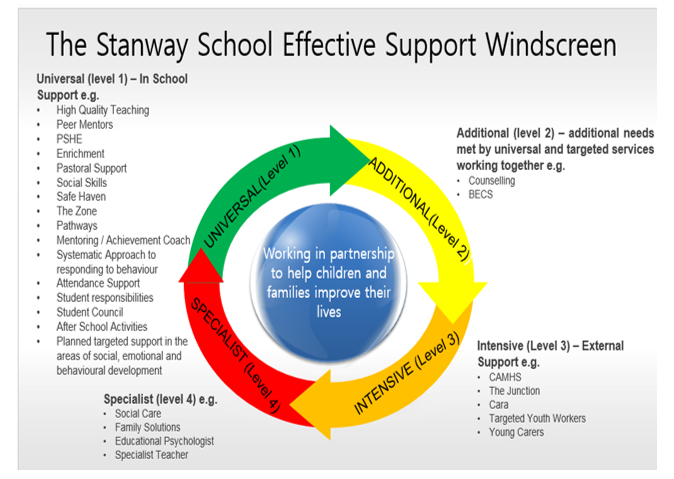 Developed the Stanway Support windscreen to enable us to support students quickly with Social, Emotional and Mental Health Difficulties through a staged approach. 2. The appointment of a school counsellor to remove barriers to attendance and SEMH difficulties. The school counsellor also signposts to appropriate outside agency support. 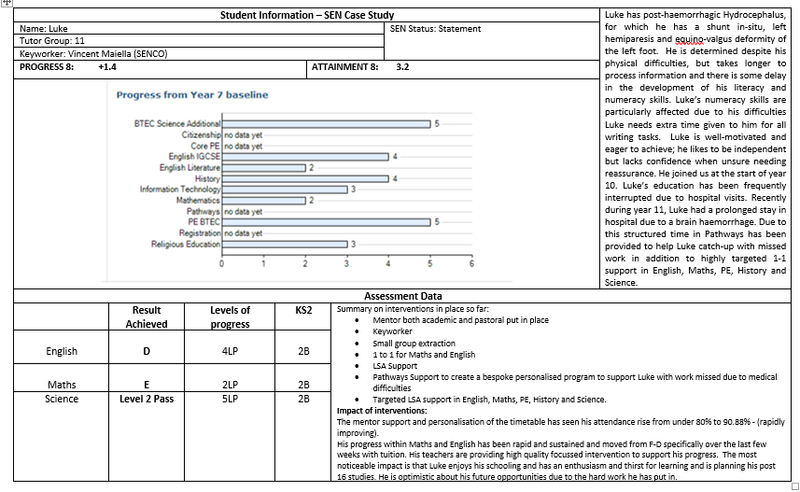 The student case study below demonstrates the impact our highly developed inclusive practice has. The student (Luke) joined the school in year 10 and needed a highly structured and supportive environment due to his medical condition and long hospital stay during year 11 resulting from a brain haemorrhage. He had a statement for SEN. This student suffered with post-haemorrhagic hydrocephalus, for which he has a shunt in-situ, left hemiparesis and equino-valgus deformity of the left foot. In his GCSE’s this student achieved a progress 8 score of +1.4 which is significantly above the national average despite the barriers this student faced. The student is now studying in post-16 education. There is evidence of a high level of CPD. We love the fact that children want to read with the dog, what happens next? There is clear evidence of a system embedded over a number of years. Kings Hill School is a two form entry primary school with two bulge years of three form. It has 476 children on role with only 11% SEN. Whilst our percentage of SEN is relatively low, our number of complex needs pupils is high due to our reputation of high quality support and inclusive ethos. We currently have 10 children on role with an Education and Health Care Plan and two more due to start with us in September, the families of which we have already begun to work with to aid transition. Eighteen of our pupils are in receipt of High Needs Funding, resulting in a high level of targeted, individualised support. At Kings Hill School every class has a teacher and TA and where necessary 1:1 support is implemented to enable our more complex children to access the curriculum, playground and school events. Our policy is clear that independence is vital and our staff work tirelessly to enable children to trainer to juniors and then on to secondary school with an ability to work at a certain level of independence to give them the confidence and ability to succeed as learners. 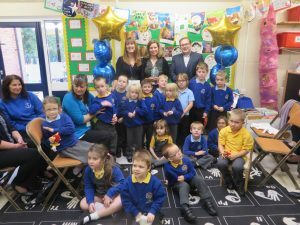 Within Kent we are known for our inclusive support of children with Special Educational Needs and work closely with local special schools as well as other mainstream schools to share good practice and draw on local resources and expertise. We access the Specialist Teaching Service, paediatrics, school nursing team and physiotherapists through referral and work closely with parents to ensure they are aware of how agencies can support us and them with their child’s development. 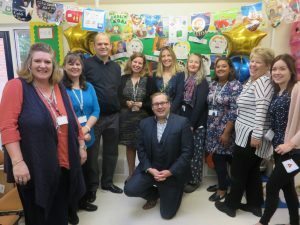 We buy in Educational Psychology, Speech and Language Therapy and Occupational Therapy to ensure assessments of children are regularly updated and our staff are fully aware of what needs to be put in place to support the children in their class. At Kings Hill School our partnership with parents is vital and starts before the children join us. Often we begin working with families up to 5 months before the children start at school, arranging visits to the home and pre-school setting, working with the agencies already involved, helping access additional funding, supporting early application for EHCP where necessary but most importantly preparing the child to feel at ease and ready to transition into primary school. Our motto ‘Inspired to believe, Inspired to achieve’ is at the root of everything we do and we ensure this underpins the support, nurture and education that we provide for everyone regardless of barriers, differences or difficulties. At Kings Hill School between 2011-2014 we saw a steady increase in the number of children being diagnosed with Dyslexia. Our belief isn’t that more children were joining us with Dyslexia but more that our ever-increasing awareness and ability to recognise children’s barriers resulted in early diagnosis and more importantly early intervention. We use a variety of methods to enable us to understand a child’s literacy and numeracy difficulties, this includes working with parents and outside agencies, book scrutinies, formative and summative assessment, interventions and observations. If we feel a child may have Dyslexia we also use the GL Assessment Dyslexia Portfolio Screener alongside the British Picture Vocabulary Scale, Wide Range Intelligence Test and Colorimetry Assessment to give us a clearer picture of specific areas of need within the dyslexia spectrum. We have accessed a high level of training in the delivery and understanding of cognitive assessments to ensure we have a clear picture of what each assessment is telling us, thus resulting in more targeted, personalised support, understanding and intervention. At Kings Hill School we pride ourselves in a whole school approach to supporting Dyslexia. Clear differentiation through personalised resources, use of adult support and manipulatives enables children to access learning in the classroom more easily. Visual support is a key part of differentiation and can be seen in every classroom on displays, in books and in personalised resources. We send home visual key-vocabulary for parents to help pre-teach children more complex terms to give children, giving them a head-start in class and the confidence to answer questions when we come to new topics. Our work, where possible is copied on to yellow or pale blue paper and enlarged to make it easier to read. Children are given word mats, vocabulary sheets, privacy stations, sloping boards, pencil grips and even overlays where the child feels it is of benefit. Teachers have all been trained in supporting children with Dyslexia and a shared belief in the fact that children learn best in the classroom rather than being taken out of class for specific literacy interventions, underpins our inclusive approach to supporting children with SEND. Perhaps the main reason behind our initial research into reading interventions was not due to a drop in reading attainment or progress as such but the ever increasing message from parents and teachers that their child didn’t want to read. Children were beginning to see reading as something they had to do, something that they wanted to get done as quickly as they could in order that they could then do what they wanted. We had a shared belief amongst staff that learning to read for pleasure was perhaps the most important thing for a primary school child to do. This led us to research the use of a Reading Dog. We were already aware of research showing the impact of animals on children with Autism and began to research the impact of dogs on encouraging children to read for pleasure. 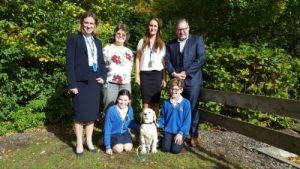 We surveyed parents and pupils to find out their views of having a dog in school, conscious of phobias and allergies. 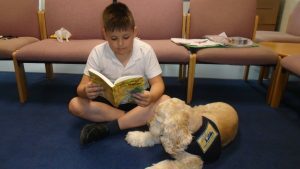 Whilst the Reading Dog intervention was met with some scepticism, all stakeholders seemed open to the idea of using a dog to support a child’s reading. Duke, our original reading dog, who still visits for two afternoons a week, was assessed in 2014 by a Reading Dogs Charity Trust. He has a very mild temperament, never jumps up or licks, doesn’t malt and most importantly loves children. We had to ensure he wouldn’t respond negatively to loud noises, sudden movement or been stroked for hours on end! He passed with flying colours and we wrote to parents to gain permission for a number of children to pilot the program. 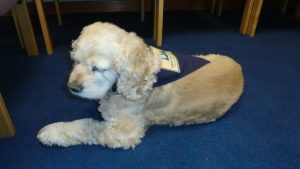 One of our experienced TAs began working with Duke and took him to collect children one by one from the classroom. As they sat and read in the comfort of our library, Duke didn’t correct the words they read, or encourage them to sound out or tell them to try again- he simply listened. In return for cuddles, strokes and lots of love, Duke sat back and listened intently to the child, no matter how well they read, how fast they finished the page or how many words they mis-pronounced- Duke loved it, and because of that- the children loved it too. We surveyed the children and parents of our pilot group before and after the Reading Dog intervention started and found that just 38% of our selected pupils enjoyed reading, after the 10 week program this increased to 86%. Further still 75% of our parents said they battled with their child to read every night, this decreased to just 6% following our intervention. We have continued to see similar figures since we began running the program in 2014. Needless to say this increased joy of reading, which led to an increase in how often the child read, resulted in increased reading attainment and progress for children accessing the Reading Dogs Intervention (INSERT DATA). What we were perhaps not prepared for was the number of children who now asked to read to, some of even our most capable readers were keen to read more- especially if it was to Duke. Not wanting to discourage, we arranged for able readers to read in groups to Duke and those struggling to access reading to read on a 1:1 basis. Some even bought pieces of writing to share with Duke, or maths program that their teacher wanted them to explain their reasoning behind. We gradually saw Reading Dogs have an impact not only on reading and in some ways writing and maths, but on the ability and confidence to speak freely without judgement. We now have three reading dogs in school and they are very much part of our team, we often joke that their excitement to come into school and see the children is infectious. One of the things lost in a society so focussed on data and outcomes is the long term impact of a child finding pleasure in picking up a book. At Kings Hill School this is something we are delighted that our children now have, regardless of their ability. It was a pleasure to read about the high level of support you offer to parents and their feedback. It would be interesting to hear about how the parents were involved in the training and how it has since developed. We are a small special needs unit based within a mainstream school. We are located in Ashley near New Milton in the south west of Hampshire. We currently provide education for 19 children aged 4-7 years old, who have complex and severe special educational needs such as Autism, Down Syndrome, Speech and Language difficulties and Developmental Global Delay. Children who attend our setting have a recognised SEN need identified through an Education Health Care Plan and the SEN department at Hampshire County Council place children with us. Our unit’s catchment covers a wide geographical area including the whole of the New Forest area and part of the Waterside area of Southampton. Many of our children are transported to school by minibus and we do not have daily face to face contact with many of our parents. We feel the relationship between parents and school is extremely important to develop a full understanding of each child’s strength, next steps and valuing every child’s uniqueness. We recognise that being a parent of a child with Special Educational Needs presents parents with an additional range of challenges including coping with their child’s medical issues, and behavioural, emotional and sensory needs. We also recognise that parents of Preschool aged children have access to personalised support such as from PORTAGE or SEN advisors. Our parents have reported they miss this level of support when their child starts school. We felt we needed to provide additional support for parents with a variety of support strategies which are presented at a bespoke level or group meetings. Our parents are fully aware of our application and have been involved in providing their viewpoints and opinions to support our application. Our parents shared these views. We have used a wide range of strategies to develop parent’s partnerships. Below are just a few of the approaches we have developed with our parents. Transition between settings can cause excitement and some uncertainty. For children who are joining our school we build a positive relationship from the start. We have good relationships with Preschools & SEN advisors and they will visit the school with the family. We personalise the transition meetings to every child’s needs. The length and amount of sessions is guided by the child and their family. We provide social stories about starting school including photos of the setting and the staff members. Together we write an ‘all about me’ book to inform staff about each child. This also provides reassurance for the child while they settle in. We also develop links by completing annual home visits to discuss the child’s needs, motivators and dislikes. This helps establish the child’s understanding that school and home are linked. For children who are leaving our setting we arrange joint meetings for parents and our staff to visit prospective schools together. To support children’s transitions we ensure a familiar member of staff visits the school with the child, we also provide social stories to ease transition. We are delighted to see a comprehensive list of activities showing progression and evidence for this award. We are encouraged by the fact you have in place a variety of systems and support. Joseph Chamberlain College is a sixth form college (SFC) in inner-city Birmingham catering for 2000 16-18 year old students and, unusually for a SFC, approximately 600 adult learners. Also, unusually for a SFC it delivers a high proportion of vocational qualifications, approximately 50% of its provision. 80% of its 16-18 provision is delivered at level 3. The majority of students do not have English as their first language. A recent survey showed 85 different non-English languages are spoken by students. 98% of students are from ethnic minority backgrounds which is significantly higher than the city other colleges in the UK. Socio-economic performance indicator data shows that, with an average Index of Multiple Deprivation (IMD) score of 52.0, the highest of any SFC in the country, the College has the highest levels of deprivation locally, regionally and nationally. The College ranks in the top 1% for 16-18 and 19+ students in terms of deprivation levels. Before the withdrawal of Educational Maintenance Allowance (EMA), 84% of all 16-18 students claimed the highest rate of allowance and continue to do so under the new Bursary Scheme. As with the 16-18 year olds, the vast majority of adult learners live in Super Output areas of high multiple deprivation, as recognised by Birmingham City Council. Applications to the College come from pupils of over eighty secondary schools in the City and further afield and more than 4000 prospective students applied to the College for places last year. The percentage of young people gaining five GCSEs at A* to C, including English and Mathematics from many main feeder schools is considerably lower than the national average. The average GCSE point entry scores of students entering Joseph Chamberlain College at Level 3 is consistently lower than the national average for SFCs (5.7 – mostly Cs with some Bs at GCSE against a national average for SFCs of approximately 6.1 – mostly Bs at GCSE). 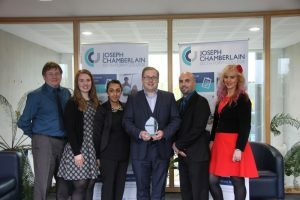 Joseph Chamberlain SFC, believes that young people and adults of all abilities deserve the opportunity to better their lives through academic study and progression to HE, employment or improved life skills. To this end, it is highly inclusive and does not operate a selective and restrictive admissions policy. In April 2013, following a number of years of declining success rates, in some cases 20% below national averages, the College was at risk of being judged inadequate in its Ofsted inspection. However, following the Principal’s bold and foresighted whole-college restructure at the start of that academic year, including replacement of the majority of the senior leadership team, the College was able to demonstrate to inspectors that it had recognised all of its areas for improvement and had put plans in place to tackle them. The College was graded as requires improvement across all aspects. The re-inspection that took place 17 months later graded the College’s overall effectiveness as good and the effectiveness of leadership and management as outstanding. In 2016 the College achieved the highest A level pass rate, 99%, of any college in Birmingham or Solihull for the third year running. Progress measures for some subject groups were the highest of any in the country. Btec pass rates were at 99%. In 2016 90% of students progressed to university against a SFC national average of 67%. On success rates alone the College was 14 out of 94 SFCs, many of those above with exclusive intakes. 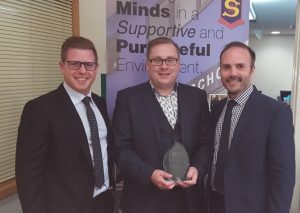 These outstanding achievements saw College feature in the annual Parliamentary Review, which was forwarded by the Chancellor of the Exchequer and it was shortlisted for the Times Educational Supplement Sixth Form College of the Year. Learners with learning difficulties and/or disabilities (LLDD) benefited from this remarkable upturn. After lagging significantly behind non-LLDD performance for some years, LLDD performance is now in line with non-LLDD across all measures. Students with learning difficulties achieve less well compared to other students and the difference has increased since the previous inspection. In 2013 16-18 LLDD success rates were 76% against a College 16-18 non-LLDD rate of 83%. The following year whilst non-LLDD rates rose by 5% to 88% the LLDD rate rose by only 1% to 77%, meaning the gap had widened to 11%. A radical new approach was required; the College repositioned additional learning support (ALS) responsibility. It was removed from Student Services and placed within the remit of the Assistant Principal for Learning and Standards. A fresh and innovative strategy was developed to align with the College’s new 2013 to 2016 strategic plan, Establishing Excellence for Every Student. This drove some key interventions. Culture change – ALS was re-branded as Inclusive Learning (IL) to emphasise that support is part of the whole learning experience and not an ‘addition’. This was promoted by an internal and external marketing campaign that highlighted the support available and the advantages for students who accessed this. Extra identification points – every prospective student was questioned about possible additional needs not only on application, but at interview and enrolment, whether they had declared at application or not. Links with schools through personal contact with special educational needs co-ordinators (SENCOs) were firmly established and the College formed a collaborative network including events for SENCOs to better share of information and support student transition from school to the College. Referral to IL team – the IL team became involved in the interview and enrolment process, with all LLDD being met by the support team during each process to assess and discuss needs and subsequent support. Where the College holds interviews for prospective students at feeder-school sites to reduce disruption, a member of IL staff attends on every occasion. 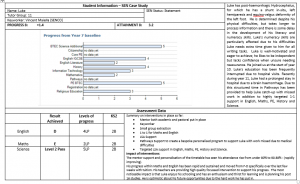 Detailed individual support plans (ISPs) – ISPs were created (online for easy access for all relevant staff – teachers, IL key worker, tutor etc.) to identify, before students start at the College, the adjustments required. ISPs identify: the nature of the need; what the teacher must do; what IL must do; what the student must do. Accessible ISPs have led to greater co-operation and discussion between teachers, tutors and IL staff about meeting individual needs. External links – the College has developed its links with the local authority (LA) and has taken deliberate action to foster a strong relationship with the LAs designated Pupil and Support Officer. Existing networks, such as the Birmingham South Network, are now accessed to further enhance information sharing and exchange of best practice. Data analysis – monitoring of performance of different groups had developed since the restructure but the College has gone further and introduced systems that allow interrogation of ‘live’ data for key performance indicators, including performance of individual students at a subject assessment level. This has created the ability to provide rapid and meaningful interventions where they are most needed. More thorough interrogation of data now takes place to understand the impact of support and any patterns of underperformance. In 2015 the LLDD rate rose significantly to 88% in line with the non-LLDD rate and 10% above the national average. High success rates were maintained at 86% in 2016 in line with the College rates, still significantly above the national average of 77%. It was not only success rates that had increased. Identification of needs went from 253 enrolments in 2013 to 665 in 2016. Remarkably, despite this incredible rise in quality, through thoughtful timetabling and scheduling of more group rather than individual support, IL reduced its expenditure in 2016. This met yet another aim of its strategy; that of generating greater student independence, through a programme of carefully managed reduction in support and better monitoring of the impact of IL staff interventions with individual students. Key to the outstanding achievements of the College’s inclusive learning practice has been the relentless drive for improvement. Future improvements are already planned. Central will be the specialisation of support for students who present with medical issues, particularly low level mental health issues. This will be realised by the employment of a nurse, a role new within the College. The role will provide greater support for students in managing their conditions and it will release the IL team to focus more support on LLDD which is not medically based. The new data analysis system that has been established and allows real time analysis of data will be further enhanced. Over the next year it will be refined. Leaders of curriculum will be trained in how to access and use the data so that they can extend their monitoring and management of performance in-year, without the need for the IL Manager to initiate low level interventions. The even greater embedding of the College ethos, that responsibility for performance of all students lies with leaders of curriculum, will be the result; yet another indication that the College operates in an exceptionally diverse but wholly inclusive, learning environment.